Back when I started graduate school, I had really gotten into cooking Indian food because as a vegetarian it was relatively inexpensive and it allowed me a great deal of variety in the dishes I could make. Even though I had an Indian restaurant directly behind my apartment complex (literally), I made my own a couple of times a week. The hardest part of embarking into Indian cuisine was really just stocking up my pantry with spices, which I now always have on hand, replenishing as needed. One big tip I have for you is to buy your spices in bulk and refill your bottles – you will save money and have fresher spices on hand. Spices lose their scent, flavor, and nutritional benefits the longer they sit. Have you ever smelled that dried oregano after you’ve had it tucked in the back of your cabinet for 2 years? It likely smells more like saw dust than oregano. When researching recipes to make, I came across a bean I had not yet had, chana dal (also known as Bengal gram or kala chana), which are a type of chickpea. They are of a particularly variety (Desi), which has smaller darker seeds and a rough coat, cultivated mostly in India, much of the Indian Subcontinent, as well as Ethiopia, Mexico and Iran. In comparison to other types of chickpeas, Desi have a higher fiber content and a lower glycemic index, and hence a less marked impact on blood sugar and insulin. Those purchased in stores are generally split with the skins removed, revealing their yellow inside. Back when I initially discovered chana dal, I found a simple recipe that has since been my preferred way to make it. 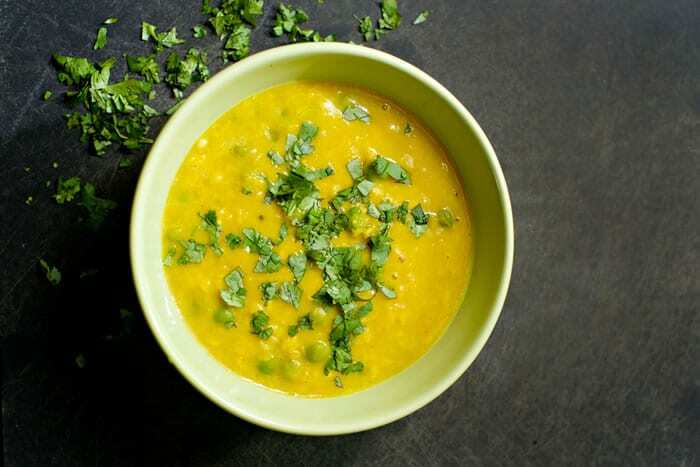 More recently I have made some minor tweaks adjusting and adding spices as well as green peas, which add a hint of sweetness and provide a nice textural balance (crunch) to the smoothness of the dal. I generally double the recipe to make enough for quite a few meals during the week and to freeze some to have on hand when I don’t have time or energy to cook. There are a lot of great things about this chana dal recipe. For one, it’s delicious and a great introduction to Indian cooking because it’s not difficult and allows you to adjust the spices to your taste. This is especially nice if you are new to not only cooking but also eating Indian food. Second, the desi are really healthy and easy to digest. Like I mentioned above, they provide a lot of dietary fiber and protein. In addition, they are full of minerals such as calcium, phosphorus, iron, zinc, manganese and copper. Lastly, the turmeric adds a boost of anti-inflammatory power. Below you will find the main recipe, but I have found many ways to eat it so that it’s different throughout the week. 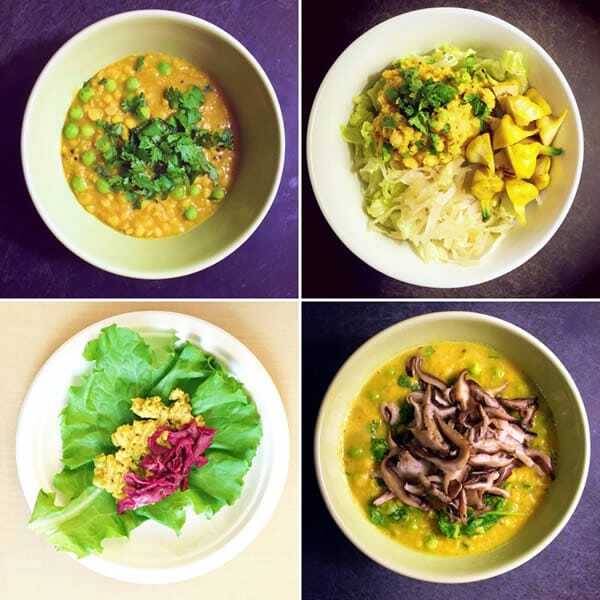 As the dal stays in the refrigerator over the subsequent week, it will thicken – allowing you to eat it cold as a salad topper or a wrap filler. Alternatively, you can reheat it to eat over rice, quinoa or another grain. Or, you can make it into a soup by adding water or broth when reheating to thin it out, and then tossing in some spinach or other greens at the end for added flavor and nutritional boost. You really can't go wrong by making this chana dal recipe. Have fun experimenting and let us know what variations you come up with! Measure the dal into a bowl and sort through it to remove any unskinned (dark) dal, small stones or other debris. 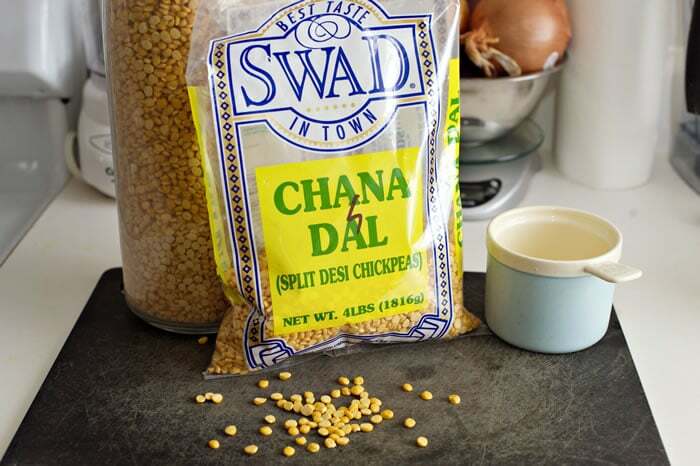 Soak the chana dal in 4 c. water for 2-3 hours, then wash under running water and drain. Bring the water and salt to a boil in a medium-size pot. Add the chana dal and wait for the water to begin its second boil, then cover the pot and cook over medium-to-low heat for 30 min. Some foam may develop while simmering - just use a ladle to remove and recover. When done, remove the cover and stir up the dal. Add the peas, cayenne, turmeric, cumin, coriander, asafetida (if using), and the tamarind pulp. Stir well and allow to simmer uncovered while you prepare the next step. In a separate small pot or frying pan, heat the oil over low heat and add the mustard seeds and chopped garlic to it. When the oil gets hot, the mustard seeds will begin to pop. When they have ceased popping, add the oil mixture to the simmering pot of dal, stirring once with a spoon to mix in the new ingredients. Immediately cover the pot and keep covered for 2 minutes while the dal continues to simmer. Cook uncovered for another 5 minutes. Taste to correct seasonings such as salt and other spices (increase keeping the same proportions). Asafetida is used as a digestive aid, in food as a condiment, and in pickles. It typically works as a flavor enhancer and, used along with turmeric, is a standard component of Indian cuisine, particularly in lentil curries, such as dal. It can be found in Indian or other ethnic and specialty markets. Nancy Wayne, but I thought that Chana Dal IS chick peas. I don’t quite understand what you’re saying here. If you want to add some more flavor, then once the mustard pops, add chopped onions and ginger garlic paste, fry with minimal oil/ghee until translucent and then add chopped tomatoes along with a 1/4 tsp of haldi and maybe even any coriander powder (if u like heat, u an add chili powder). Once the tomatoes etc are cooked well (tomatoes take 5 to 10 mins or so to be really cooked through), then continue as you mention, adding the Chana dal in and some water and letting it all cook a bit together. 🙂 n honestly, onions and ginger garlic paste fried to either translucency or golden brown is a common base for numerous Indian recipes. The taste they impart to ANYTHING is to die for!! ? Yum! I LOVE me some Indian food! This recipe is a great source of protein, and yes, carbs! Thank you.